The tablet computer — especially the iPad — is increasingly in use as an electronic flight bag. No other piece of equipment in the recent history of aviation technology has become as popular with pilots as quickly as Apple’s iPad tablet computer, which increasingly is being used as an electronic flight bag (EFB). Boeing also recognizes that the iPad has “gained rapid, unprecedented popularity as an EFB in all aviation market segments.”2 Jeppesen, a Boeing subsidiary, has developed a charting app that the U.S. Federal Aviation Administration (FAA) authorized for use in February 2011. In December 2011, American Airlines was the first airline authorized by the FAA to use Jeppesen charts on iPads in all phases of flight; and many air carriers are evaluating mobile EFB platforms that include iPads, and are using simulator and in-flight studies to help develop procedures and training programs, and to validate the use of the equipment in all phases of flight, according to Boeing. The iPad’s success does not come by chance. The technology debuted when flight operations departments already were considering EFBs but had been limited by the often-prohibitive cost of EFB hardware. The much lower acquisition cost of the iPad seems to have enabled a speedier transition to EFB technology. Because of the recent evolution of EFB technology and the expected large-scale introduction of mobile devices onto the flight decks of commercial airlines, the FAA recently released Advisory Circular (AC) 120-76B containing guidelines for the certification, airworthiness and operational use of EFBs (ASW, 5/12). According to definitions in the updated AC, the iPad can be used as either a Class 1 or Class 2 EFB. Class 1 EFBs are not typically mounted to the aircraft, and they are not connected to aircraft systems for data. Class 2 EFBs typically are mounted, but can be easily removed from their mounts by the flight crew, and they may connect to data ports (wired or wireless) or installed antennas. iPads cannot be Class 3 EFBs, which are permanently installed in the aircraft. According to the AC’s definitions, the iPad is capable of hosting Type A and Type B software applications. Type A applications are intended primarily for use during flight planning on the ground or during non-critical phases of flight. Type B applications provide aeronautical information required to be accessible at the pilot station and are intended for flight planning and all phases of flight. Because the iPad already is used by many flight departments as an EFB during all phases of flight, there are few, if any, issues with regard to the iPad’s certification. 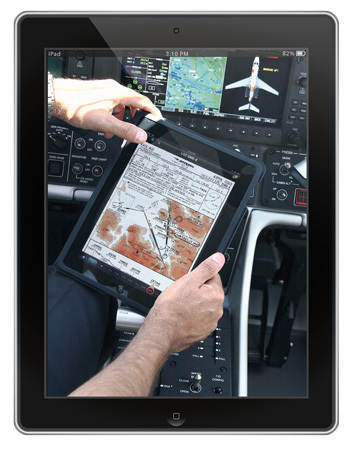 However, the FAA requires each operator to apply individually for approval to use the iPad as an EFB. Therefore, operators must consider the safety requirements set forth in the AC, especially those dealing with issues of long-standing concern such as electromagnetic interference, rapid decompression and the human factors/automation issues. For some time, there has been concern that an iPad, as a transmitting portable electronic device (T-PED), could interfere with flight deck avionics. In particular, it has been reported that “Apple uses a capacitive touch screen, which detects a finger electro-statically and is susceptible to electromagnetic interference.”3 Within the pilot community, there seems to be a consensus that this concern is overstated. The FAA, however, says in the AC that “to operate a PED during all phases of flight, the user/operator is responsible for ensuring that the PED will not interfere in any way with the operation of aircraft equipment.” The AC describes two non-interference testing methods, either of which may be used by applicants. Method 1 comprises two steps. Step 1 requires an electromagnetic interference (EMI) test in accordance with RTCA/DO-160, the standard for environmental tests of avionics hardware published by RTCA, formerly known as the Radio Technical Commission for Aeronautics. The need for each operator to receive approval for iPad operation as an EFB, and in particular the need for each user/operator to conduct EMI testing, has prompted the emergence of companies that supply customized testing, which could be an option for operators that do not have the necessary in-house testing expertise. iPads meant to utilize Type B software applications in pressurized aircraft must undergo rapid decompression survivability testing that complies with RTCA/DO-160. Tests are not required if only Type A software applications are used, if alternate procedures or paper backups are available, or if the iPad is meant for use in unpressurized aircraft. With regard to decompression testing, the AC says that “similarity of a particular EFB to a unit already tested may be used to comply with this requirement. It is the responsibility of the operator to provide the rationale for the similarity.” Soon after its release in March 2012, the iPad 3 was tested successfully for rapid decompression at 51,000 ft equivalent altitude, the maximum service ceiling of business aircraft. The AC contains a section dedicated to “EFB system design considerations” that touches on the human factors/automation issues associated with using the iPad as an EFB. In addition to the iPad’s user-friendliness, Apple’s tablet is appreciated in the flying community because of its battery life, the stability of its applications and the fact that the approach plates are well lighted and easily viewed by pilots, even at night. iPad technology also may contribute to enhanced aircraft operational performance. While these remarks were originally made when EFBs were not yet a major flight deck instrument, they nevertheless apply to the additional automation introduced by iPad technology. A Boeing 747 captain and flight instructor who retired from a major European airline more than 10 years ago shares the concern about the development of inappropriate mental models and provides an interesting perspective: “The younger generations of pilots will have little, if any, difficulties adapting to the iPad. However, the risk for this category of pilots is that [if] they accept this technology without a critical spirit, trusting it blindly, … they will be totally without backups and appropriate skills in case of a total EFB system failure. On the other hand, older generations of pilots are likely not to trust the iPad as a new piece of equipment and favor their instinct instead”. In laying the groundwork for the transition from paper, the AC says that “at least two operational EFBs are required to remove paper products that contain aeronautical charts, checklists or other data required by the operating rules” and that “the design of the EFB function requires that no single failure or common mode error may cause the loss of required aeronautical information.” The recommended gradual implementation of iPad technology implies a transition time during which proficiency in the new technology is built and a current paper backup is in the airplane. In the future, the iPad will have other functions on the flight deck. Mario Pierobon works in business development and project support at Great Circle Services in Lucerne, Switzerland, and was formerly with the International Air Transport Association in Montreal. “iPad makes its way to the Airbus cockpit” Airbus, Noticias Airbus No. 140 January–February 2012. “Operational Efficiency of Dynamic Navigation Charting” The Boeing Company, Aero Quarterly Q2 2012. “Advancing Vision”, Graham Warwick, Aviation Week & Space Technology, May 14, 2012. Jeppesen and Garwood Labs Rapid Decompression Test – Jeppesen Training (Published on March 23, 2012), <www.youtube.com/watch?v=xvQAUyMBeiY> [accessed Aug. 20, 2012]. Approaches to mitigating complexity-driven issues in commercial auto flight systems, Sanjay S. Vakil, R. John Hansman, Reliability Engineering and System Safety 75 (2002) pp 133-145. “The Value of Back Office Integration” Electronic Flight Bag (EFB) White Paper, IMDC (NA). “Electronic Flight Bag: Real-Time Information Across an Airline’s Enterprise”, Boeing, Aero Quarterly Q2 2008.